Cheviot Sheep are white-faced Hill sheep from the Scottish Borders. 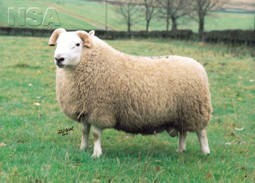 The ewe has fine hard white hair on her face over the crown and on her legs which should have a fine, flat quality bone. The fleece should be dense and firm with no kemp or colored hair. The rams can have horns.